Geofencing is a popular option for modern mobile applications. The concept of a geofence is simple; draw a virtual boundary around a point on a map, like a fence around a yard, which can then monitor when a mobile device crosses the boundary. Businesses can utilize geofences as part of their mobile strategy to create location awareness and provide context for meaningful interactions with their users. BHW believes geofencing is a key mobile app trait that is easy to implement and fosters user engagement. This article explains geofences in more depth by discussing how a geofence can be used to facilitate a popular game. Capture the Flag is a favorite summer camp game of many children. If you recall the rules are pretty simple, steal the other team’s flag and return it to your side and you win. Meanwhile, if you tag someone from the other team, while they are on your side, they’re out. But, if they make it back to their side first, they’re safe. Unequivocally, each time this game is played a dispute breaks out regarding on which team’s side a tag occurred. The game breaks down as both teams argue and the game is in some small way tarnished. The problem this game faces is that it occurs, not on a basketball court, soccer field, or baseball diamond where there are clear lines indicating boundaries, but in the real world. It is played in empty fields, in back yards, and in woods. How could you possibly define discrete boundaries in places like these? Geofencing allows virtual boundaries to be defined on a map. It can be a circle around a specific point, or two polygons representing sides of a Capture the Flag field. It allows you to create boundaries in the real world and can be used to alert you when something enters or leaves a particular area. Geofencing used in a capture the flag game. 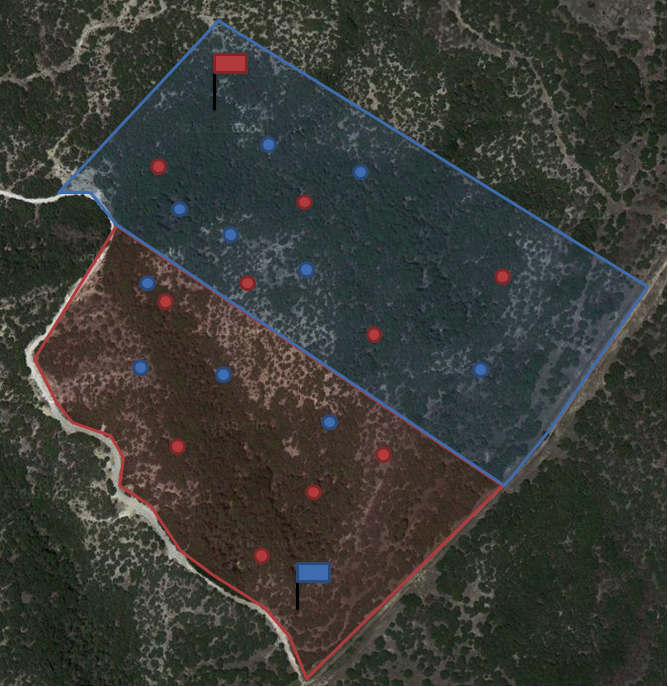 Let’s imagine that we apply geofencing as a solution to our boundary problem in Capture the Flag. We start by asking each Capture the Flag player to wear a small GPS device that we’ll use to locate them on our virtual field. Prior to the game starting we will establish two geofences representing each team’s side. In the image we show our sides as red and blue, and each player as a red or blue dot. Each time a player crosses the middle line, their status (safe or unsafe) will be updated as they exit one geofence and enter another. This way when a player is tagged, we will know if they are in fact on their own side, and thus safe, or if they are currently on the enemy’s side and therefore out! Another common dispute during capture the flag games occurs when the two teams disagree on whether the flag made it across the middle line or not. This argument can also be solved with geofencing. Simply place another GPS device on the flag and whenever it exits its side of the map, determined by the device exiting the geofence, set off some trigger indicating the game has concluded. Although such a solution would brighten the summers of many children, it is just one small example of the usefulness of geofencing. Geofencing is an extremely powerful tool for mobile developers. A large facet of modern web development, and in particular mobile development, is making use of the vast amount of information that is available. You can use this information about your user to customize and enrich their experience. This can lead to a more enjoyable and profitable mobile app. Many successful websites rely on this information. Facebook uses your “like” information to generate advertisements that are likely to be of more interest to you. Groupon uses your address to tailor coupons based on where you live. Amazon makes use of your buying and browsing habits to suggest other items you could be interested in. Sure, these can be great features for end users, but they also significantly increase the revenue of these companies. Geofencing is a powerful tool that can similarly be used to increase revenue. Here is an example. There are of course numerous additional uses of this powerful technology. Geofencing is a powerful tool that can be utilized by mobile application to improve the experience for your users while also increasing your revenue. It utilizes one of the most crucial bits of data available to mobile applications – the user’s location – and customizes the application experience accordingly. Do you need an expert in mobile app development? With a team of mobile app development specialists covering a wide range of skill sets and backgrounds, The BHW Group is prepared to help your company make the transformations needed to remain competitive in today’s high-tech marketplace.